One thing I always look for when talking to teachers about using technolog is something that they can use immediately, without changing their core belief about themselves as educators, or their key role as teacher. I put the arguments around that aside (sage on the stage > guide on the side > meddler in themiddle) and try to look for simple things that teachers can use in their very next lesson that wil have immediate benefit for their students. 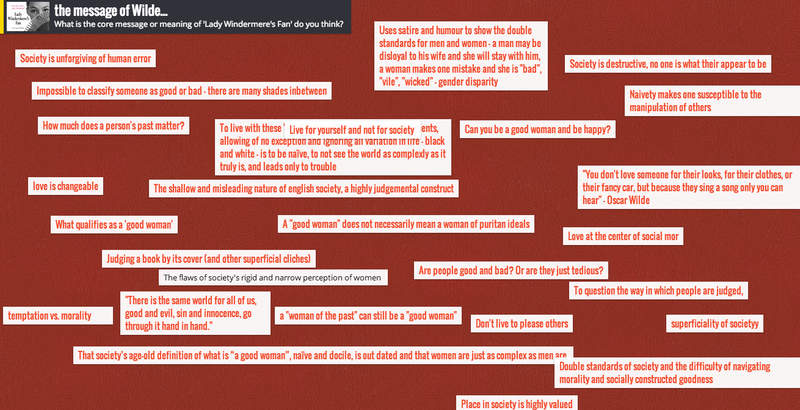 So, things like Padlet are great. Padlet (formerly Wallwisher) is a simple web tool that works just as well on iPad as PC, is free, requires no sign-in and allows a group of students to brainstorm or discuss by adding ideas to an online ‘wall’. Simple. I’ve used with my Literature class a few times this year: to document a discussion we’re having in class (one person is assinged as blogger to capture the conversation), for students individually or in groups to put up some discussion points, or for the same thing to be done at home as a homework task. You can run through the ideas one at a time really easily and ask the students to comment on why they made that contribution. And, at the end, you can embed, make a link or make a PDF or image out of the ‘wall’ and put it on your class home page or email it to the students. Last year I got pretty interested in the application of what Vic Zbar called ‘highly effective micro-teaching strategies’, particularly in the area of feedback and formative assessment and particularly related to the Hattie research and applications emerging from all that. Things like: ‘wait time’, ‘no hands up’, the icy pole stick questioning and the ‘pounce and bounce’ strategies, some of which I blogged about last year, and most of which are firmly analog. It’s hard to imagine something more low-tech than an icy-pole stick, even one decorated lovingly with texta and fineliner pen. I enjoyed that thinking and aim to continue lots of those approaches this year. One new thing I’ve want to explore is some of the work around ‘explicit teaching’ and particularly the lesson stages approaches that move from things like a ‘hook’ or intention to instruction, guided practice, group work and individual practice, concluded by revision, review and next steps. These are largely American ideas, but have been interested in how they’ve developed from there. Every lesson must have impact, every lesson should have a coherent learner-centric structure. Sort of makes sense, but it also seems daunting to do that for every class every time. 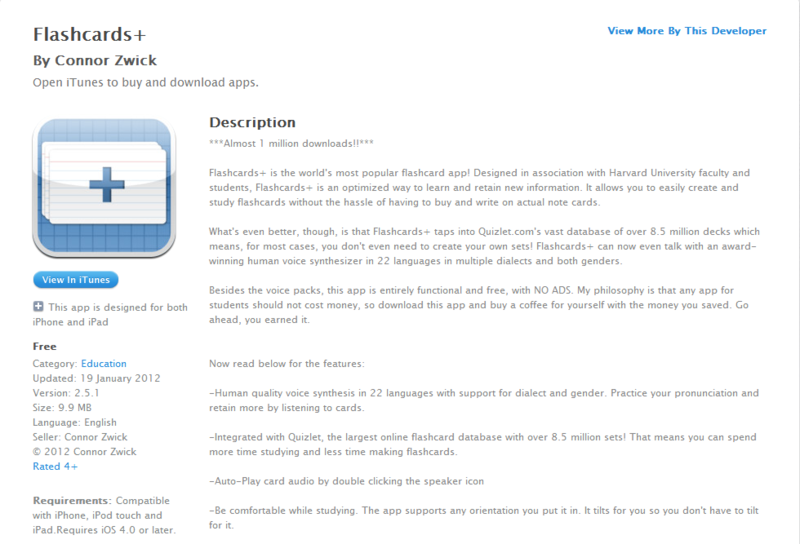 So, I was interested to see whether there are lesson planning apps that might help, and came across Planbook. Planbook has been a Mac app for a while and I know nothing about that except that it’s about $36 and I’m not sure how well it syncs with the iPad version, which I bought for $9.99. Don’t be confused; there’s several Planbooks out there. I’m talking about the one from Hellmansoft. What I like about Planbook is its ability to cope with a variety of timetables including our ten day rotation but the ability to customise the fields are the big winners for me. Below, you can see the editing view of Planbook on the iPad. It’s not the prettiest setup in the world, and it would be easier on the Mac I’m sure, but it works well, syncs with Dropbox and is pretty user friendly. 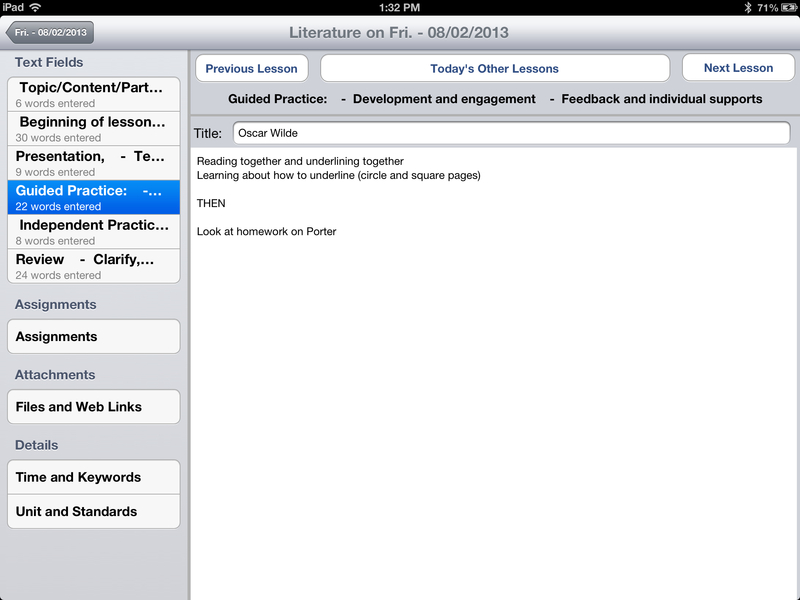 On the left hand side you can see the fields I’ve set up for each component of the lesson. Below, you can see the weekly view. 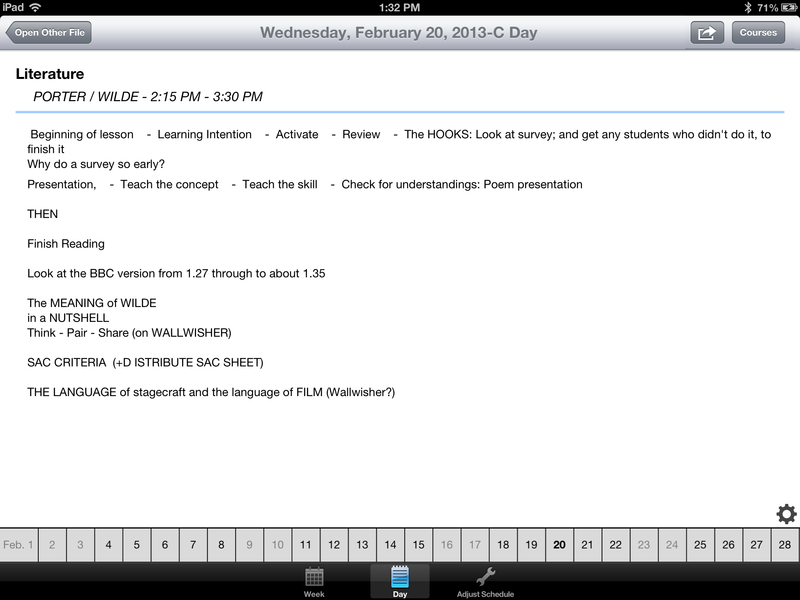 I’ve got three lessons this week (in green) and you can see the subject name, times and the lesson plan there. Below, you can see the single lesson view (not in edit mode) I’ve been using this as my lesson planner, having the iPad on my desk as the planner, and the computer plugged into the data projector showing the students the lesson content or activities. It is a bit daunting to plan every lesson in this detail, and to be honest some of the year 12 lessons don’t go exactly this way. But, it has really sharpened my planning and I’m going to persist with this and give it a decent trial. 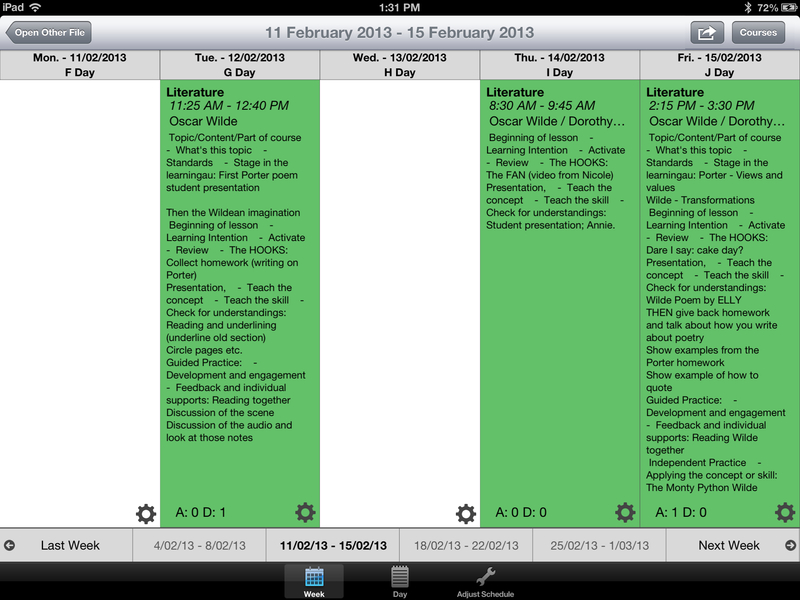 I was considering using Evernote as the lesson planning tool (setting up a blank note with the six fields and simply copying that to a new lesson), but this more purpose-built app has some advantages over that approach, particularly its integration with your timetable schedule. If it really did sync well with the Mac version, it would be even more powerful. 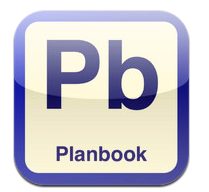 Watch a screencast of the basics of Planbook below; it’s the Mac version, but the basics are the same. I saw this on Twitter this week and shared it with some people at school.It’s from Sheryl NussbaumBeach @snbeach What do you think? Too zealous and idealistic? As a teacher I like the idea of ‘messy learning’ and the ideas of the teacher as interventionist in a collective and collaborative learning world. As a teacher-leader it’s also a bit confronting; how we can be sure we’re going to get something beautiful out of this messed up stuff, and not simply a mess?